Preface: I cleaned and typesetted five pages of manga for this post. Read it, damn it. Eyeshield 21 was one of the first manga I ever started reading, and I own 36 of its 37 volumes in English. That’s a price tag of over $300 for one single manga series… why? Why not just read it online, where I wouldn’t have to spend a cent? Well, initially the reason was that I didn’t know about reading manga online. 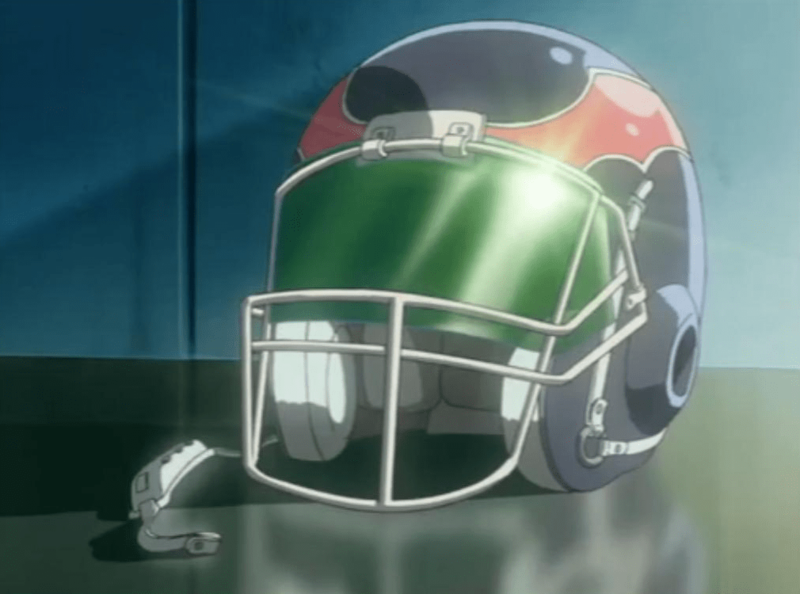 I was in middle school when I got into Eyeshield 21 – gimme a break. I could take the moral upper ground: Buying manga in English supports the original authors. I’ve spent more money on manga than I have on my entire trip to Japan. I could argue that flipping through pages of a physical book makes the experience much more enjoyable than squinting at my smartphone screen. I could also argue that owning a physical copy allows me to read and reread my favorite manga series – I’ve read Eyeshield 21 over ten times, now. These are all part of the reason why I’ve filled up two bookcases with manga, and why I continue to buy more volumes. But until recently, I didn’t realize that there was another, very compelling reason: translation and typesetting quality. Amateur scanlation groups pale in comparison to professional translation companies like the one VIZ Media used for Eyeshield 21 (HC Language Solutions). Below I have displayed two different versions of five pages of chapter 305 of Eyeshield 21. The first was translated and typeset by Franky House Scans in 2008 (using the translations from an earlier release by ryColaa Scans) and the second is copied from the official English version of volume 34, released in 2011. I didn’t want to tear open my book to scan the pages directly, so I cleaned the Franky House pages and typeset all of the text myself, sticking as close as possible to the original format. For some background: This scene occurs immediately after Sena and the Deimon Devil Bats beat Teikoku and win the Christmas Bowl. A couple volumes before this, they beat their rivals, the Ojo White Knights. The third years of the White Knights are forced to give up their dream of winning the championship, and here Sena runs into them right after achieving their dream. 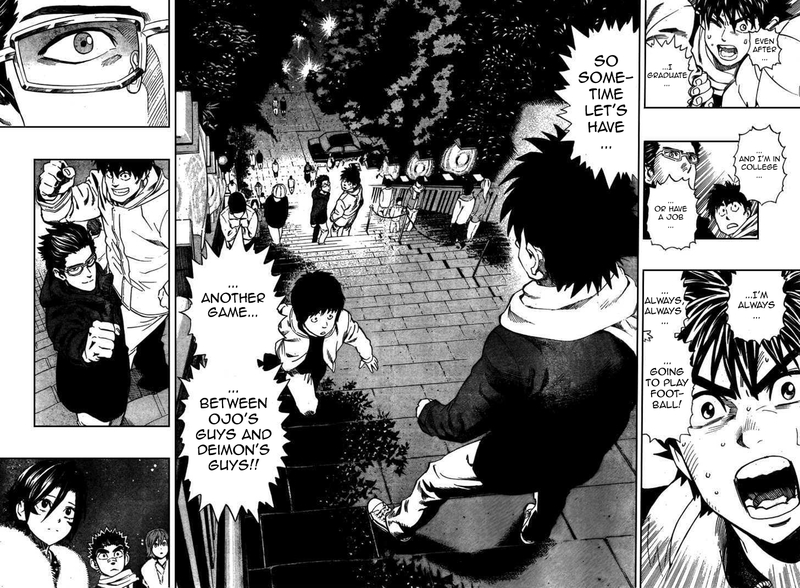 As Takami and Otawara walk away, Sena runs after them. Even… After I graduate, I will always… When I go to college, in the college league! When I find a job, in the semi-pro league!! Even after that I will always… always.. play American football! That’s why, one day … let’s have a match between the members of Oujou and the members of Deimon!! Even after… …I graduate… …and I’m in college… …or have a job… …I’m always… …always, always… …going to play football! So sometime let’s have… …another game… …between Ojo’s guys and Deimon’s guys!! While there are many memorable moments in Eyeshield 21, this is the greatest in my opinion. This marks the decisive end to a rivalry spanning hundreds of chapters, and it’s an inspiring few sentences about losing something you love. But this moment seemed so important because I had read it from the English volume. Does the Franky House version perform just as well? I’d say… no. It’s worse on two counts: typesetting and translation. Here we have two panels, done by Franky House (left) and by VIZ Media aka flomu House (right). In Franky House’s version, it looks like they tried to make the text the same size wherever possible. 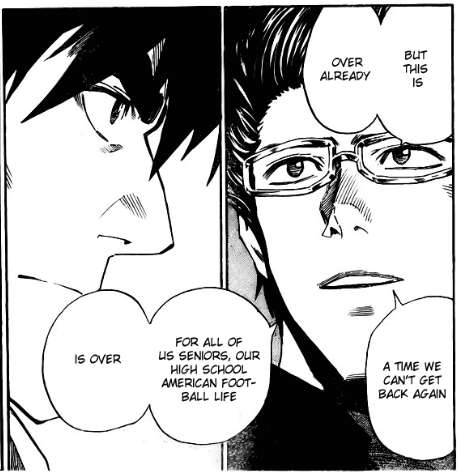 So where Takami says “is over”, the bubble looks enormous and dwarfs the text. In VIZ Media’s version, “is over” is much bigger than the stuff in the previous bubble. This emphasizes the end of these guys’ high school dream. If I had read the Franky House version, I’d be squinting instead of empathizing with Takami. While VIZ Media uses ellipses all over the place, Franky House is much more conservative with their use of ellipses. In the passage above, Franky House doesn’t use any, while VIZ uses them four times. This gets annoying when you actually write down the dialogue, but ellipses help a lot in reading manga in English. English is written in rows rather than in columns, so it’s hard enough to fit words in these vertical bubbles. However, it gets really confusing when you’re reading English from left to right while reading bubbles from right to left. That’s why VIZ tries to use these ellipses to connect sentences across bubbles. It makes the transition from bubble to bubble much more fluid. When I read Franky House’s version, I feel like stopping at the end of a bubble where there’s no ellipses: “But this is. Over already.” It’s more subtle than that, but definitely inferior to the way VIZ does it. Again, let’s look at what Sena says. Instead of transcribing, character for character, like I did above, I’m going to remove ellipses and stuff that I wouldn’t actually read. Even after I graduate, I will always… When I go to college, in the college league! When I find a job, in the semi-pro league!! Even after that I will always, always play American football! That’s why, one day… let’s have a match between the members of Oujou and the members of Deimon!! Even after I graduate, and I’m in college, or have a job… I’m always… always, always going to play football! So sometime, let’s have another game between Ojo’s guys and Deimon’s guys!! The biggest difference is the word “another” that VIZ puts in. “Another game” is way, way more appropriate here than “a match.” Franky House must be taking the honorifics way too seriously. “Another” game between the “guys” of each team shows camaraderie befitting of this epic rivalry, while “a match” between “members” is stiff and formal, and simply provides information. In this emotional moment, there has to be more than the bare bones translation. Another difference shows up in the bit about playing football in college or while having a job. Franky House’s translation sounds like a word-for-word translation, while VIZ Media takes on a much more liberal translation. The original sentence structure might have sounded good in Japanese, but Franky House’s literal English translation sounds… off. It takes too long to get the point across. Here I’m not blaming Franky House Scans or saying that they were bad at scanlating manga. Franky House and ryColaa Scans pushed out their scans of this chapter in November 2008, while VIZ Media delivered in January 2011. The amateur groups do this without pay, and the VIZ Media crew do this for a living. There’s no even ground to compare the two. Furthermore, products from both scanlation groups and official publishers differ drastically in quality. But in this one instance, I saw very striking differences between the online disaster of a scan and volume I bought and read a dozen times. It makes me feel like that $10 was worth it. Secondly I am sorry to say, however the translation we had is closer to the original meaning in Japanese. If you prefer changes, to the original words, well GO with VIZ. I agree that your translation is much closer to the Japanese, but I still prefer the VIZ version. I’m also really biased because I basically grew up reading the VIZ version. Hey sorry for the late reply — this blog is in a state of near-death and I rarely check it. I doubt you’ll ever see this reply (oops), but maybe somebody else will. While somebody in a fansub/scanlation group could give you a much better perspective, I’ll try and say something. For Eyeshield 21, I think that VIZ did an amazing job with the translation, perfectly conveying each characters’ attitude towards the other characters in their word choice. Adding in “-san”s and “-kun”s might make the character relationships more obvious, but with VIZ’s translation with all the meaning and intent of these honorifics already built into the sentences… I don’t think it would add anything. Basically, I think VIZ’s translation is geared towards a Western reader, and holds more nuances in lines like “Deimon’s guys” instead of “the members of Deimon.” Of course, it’s hard to tell from the tiny bit of dialogue in this post… but hopefully you bought Eyeshield 21 and found it was worth it! Also: other publishers/translators (Yen Press and what used to be Del Rey, for example) keep most/all of the honorifics, and it works there because they translate more literally.